The listings that appear on this page are from companies from which this website receives compensation, which may impact how, where and in what order products appear. This table does not include all companies or all available products. Bankrate does not endorse or recommend any companies. Use our national survey of lenders to find the right mortgage rate for you. We regularly survey around 4,800 banks and lenders to give you a comprehensive, up-to-date comparison. When you find a few lenders you like, click to get a personalized rate quote based on your home purchase. Once you choose a bank or lender, you'll apply for a mortgage directly with them. Then, you'll be on your way to your new home. Want to learn more about buying a home? 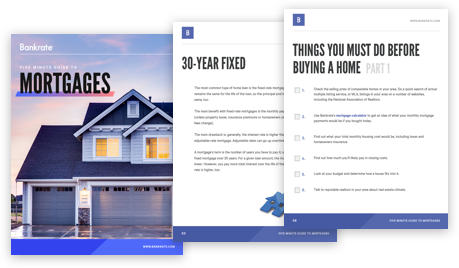 Sign up to get Bankrate's Five Minute Guide to Mortgages delivered to your inbox. On April 19, 2019, according to Bankrate’s latest survey of the nation’s largest mortgage lenders, the benchmark 30-year fixed mortgage rate is 4.12 percent with an APR of 4.25 percent. The average 15-year fixed mortgage rate is 3.56 percent with an APR of 3.77 percent. The 5/1 adjustable-rate mortgage (ARM) rate is 4.05 percent with an APR of 7.13 percent. It’s easy to confuse a mortgage interest rate and APR, but they’re quite different. The interest rate is the cost of borrowing money for the principal loan amount. It can be variable or fixed, but it’s always expressed as a percentage. An APR (annual percentage rate) includes the mortgage interest rate plus other costs such as broker fees, discount points and other lender fees, expressed as a percentage. APR is often higher than your interest rate. What are the different types of mortgages? Fixed-rate mortgages are the most common mortgage type. The interest rate remains the same for the life of the loan. With a fixed-rate mortgage, your monthly payment won't change (outside of property taxes, insurance premiums or homeowner's association fees). Adjustable-rate mortgages, or ARMs, have an initial fixed-rate period during which the interest rate doesn't change, followed by a longer period during which the rate may change at preset intervals. Generally, interest rates are lower to start than with fixed-rate mortgages, but they can rise, and you won't be able to predict future monthly payments. Jumbo mortgages are conventional loans that have non-conforming loan limits. This means the home prices exceed federal loan limits. For 2019, the maximum conforming loan limit for single-family homes in most of the U.S. is $484,350, according to the Federal Housing Finance Agency. Jumbo loans are more common in higher-cost areas and generally require more in-depth documentation to qualify. Government-insuraed loans are backed by three agencies: the Federal Housing Administration (FHA loans), the U.S. Department of Agriculture (USDA loans) and the U.S. Department of Veterans Affairs (VA loans). The U.S. government isn’t a mortgage lender, but it sets the basic guidelines for each loan type offered through private lenders. Narrowing your loan choices can be difficult. Here’s a list of pros and cons of each of the options mentioned earlier to help you decide. Rates and payments remain constant, despite interest rate changes. Stability makes it easier to budget. Interest payments tend to be higher. To get a lower rate, borrowers have to refinance the loan -- and pay closing costs again. Borrowers who plan to stay in a home many years and want predictable, stable payments at the same interest rate for the life of the loan. Feature lower rates and payments early in the loan term. May qualify for more house because payments are lower (initially). Help you save and invest more money with a lower payment early in the loan. Rates and payments can rise over the life of the loan. Higher rates -- and payments -- when loan resets can be hard to manage. ARMs are difficult to understand. Lenders have much more flexibility to customize. Borrowers who don’t plan to stay in a home for more than a few years -- especially when rates are higher. Can be used for a primary home, second home or investment property. Overall borrowing costs tend to be lower than other loan types. PMI is cancellable once you’ve gained 20 percent equity. Put as little as 3 percent down for agency loans. Minimum FICO score of 620. Debt-to-income ratio of 45 to 50 percent. PMI typically required if your down payment is less than 20 percent. Significant documentation required to verify income, assets, down payment and employment. Borrowers with strong credit, a stable income and employment history, and a down payment of at least 3 percent. Don’t require a large down payment. Open to repeat and first-time buyers. Mandatory mortgage insurance premiums that cannot be canceled on some loans. May require more documentation to prove eligibility. Borrowers who have low cash savings, less-than-stellar credit or can’t qualify for a conventional loan. VA loans tend to offer the best terms and most flexibility compared to other loan types for military borrowers. Borrow more money to buy a home in an expensive area. Interest rates tend to be competitive with other conventional loans. Down payment of at least 10 to 20 percent is needed. Minimum FICO score of 660, but average is typically 700 or higher. Maximum DTI ratio of 45 percent. Must have significant assets (10 percent of the loan amount) in cash or savings accounts. Affluent borrowers purchasing a high-end home who also have good to excellent credit, high incomes and a substantial down payment. Recent steep declines in mortgage rates have subsided as the benchmark 30-year mortgage rate hit 4.29 percent this week, up 12 basis points from 4.17 percent a week ago, according to Banrkate’s latest weekly survey of the nation’s largest mortgage lenders. Meanwhile, the lowest rates in more than a year sent thousands of homeowners to lenders for mortgage refinances. A year ago, the 30-year rate was 4.55 percent. Four weeks ago, the rate was 4.62 percent. The 30-year fixed-rate average for this week is 0.81 percentage points below the 52-week high of 5.10 percent and is 0.12 percentage points greater than the 52-week low of 4.17 percent. For more in-depth mortgage rate news, check out this week's analysis. Estimate the mortgage amount that best fits your budget. Calculate what your mortgage payment will be and how much you can afford. Determine how much of your monthly payment will go toward the principal and how much will go towards interest.